Home » Picking » Kiwifruit picking » Let’s talk about… kiwifruit picking! People tend to think that New Zealander got their nickname “Kiwis” from the kiwifruit! Sorry to disappoint you, but this nickname actually comes from a rare native bird, that also gave his name to the kiwifruit (formerly known as the Chinese Gooseberry, as it’s originating from China)! Now that everything is clear in your mind, let’s discover the picking of kiwifruit through the eyes of two experienced pickers, who accepted to share all their secrets about picking this delicious fruit. Pick The World: Hello guys! We heard that you picked some kiwifruit last season In New Zealand. As the 2015 season just started, we are very impatient to learn more about your experience! PTW: First, can you tell us a bit about yourself, so we get to know you better? PTW: What brought you to do some fruit picking in the first place? Gaetan: “I started fruit picking in Australia as it was the only way to extend my visa and also a good opportunity to save some money. When we decided to go to New Zealand, I wanted to do it again because I liked it and Fanny was keen on trying”. 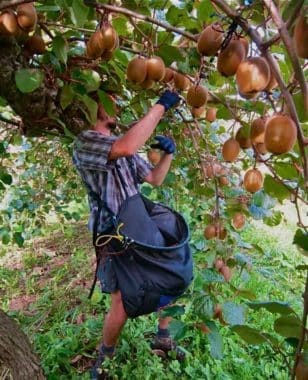 PTW: What kind of experience did you have before you started kiwifruit picking? 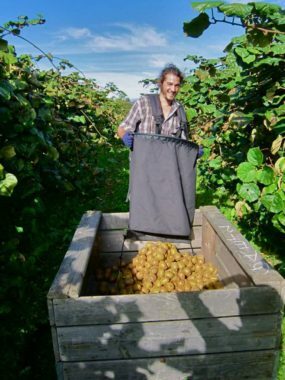 PTW: Let’s focus on your experience with kiwifruit picking, after all we are in New Zealand, the kiwifruit country! How did you hear about this job? 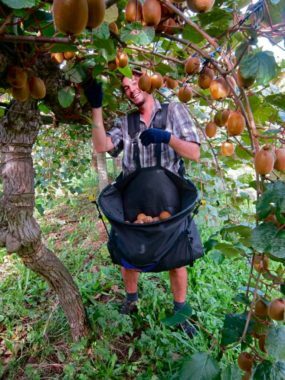 PTW: Was it difficult to find a job in kiwifruit picking? Did you have to book it in advance? PTW: Can you tell us a bit more about the kiwifruit and the way to pick them? Kiwifruit grow on vines. These are green kiwifruit. 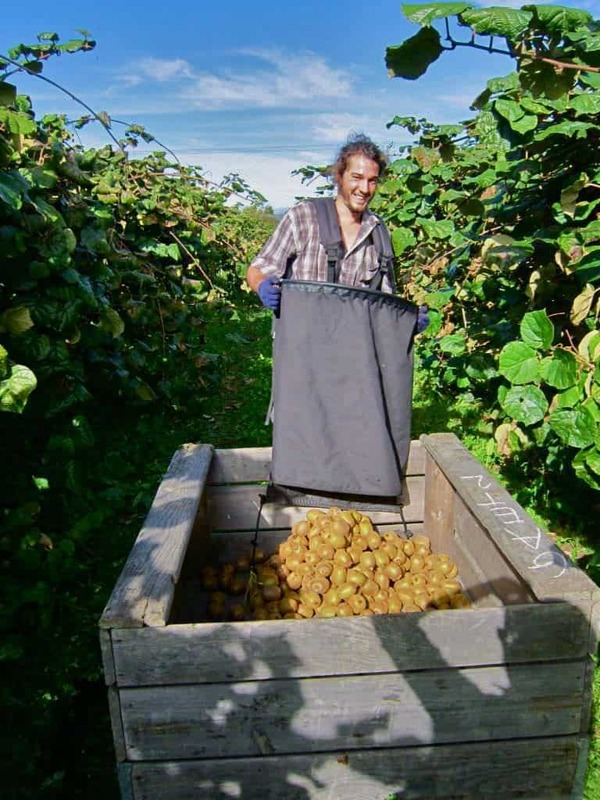 Note: They are 2 main types of kiwifruit commercially harvested: the green kiwifruit (mainly paid on contract) and the yellow or golden kiwifruit (mainly paid hourly because the skin is softer and it requires a more careful handling). Kiwifruits are grown either on “T-bar” (single rows of kiwifruit vines are planted next to each other, and the worker work under the T-bar, on his own row) or under a “canopy” (the vines are all attached together in order to make a single big “roof” where workers usually work in team). 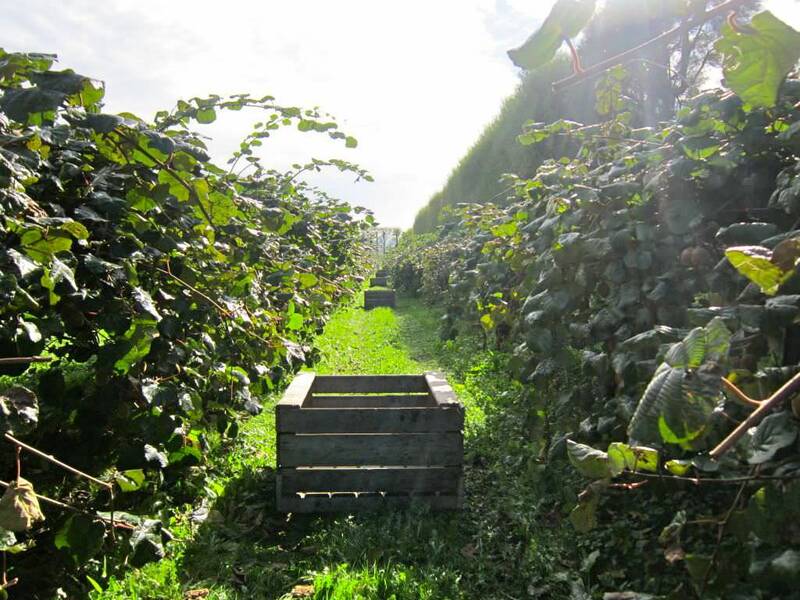 It exists different ways to grow kiwifruit: this is an exemple of a T-bar. 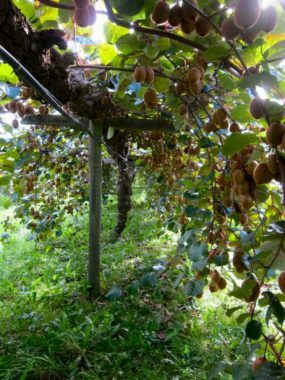 PTW: How long is the kiwifruit season going for? PTW: Did you work on contract? In team? How much did you get paid? 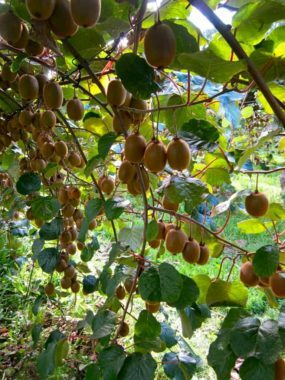 PTW: What “tools” or equipment do you need to pick kiwifruits? 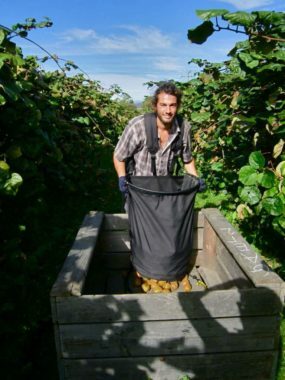 A kiwifruit picking bag and a pair of gloves are both necessary to collect the fruits efficiently. PTW: Were you happy with your earnings? PTW: Did you find the job hard (mentally and/or physically)? PTW: How was the atmosphere at work? PTW: Did you enjoy the job? PTW: Looking back at your experience, would you say that it is something you would do again? What are you plans now? PTW: What advice would you give to the people who want to start doing this job? Gaetan & Fanny: “Try to avoid orchards that have a lot of golden kiwifruit because you are going to get paid hourly. Unless you like to take your time while working, you should make better money getting paid on contract. Also, don’t forget to check the forecast every evening and every morning before work. And finally, have a lot of fun and enjoy your experience”. Thank you very much to Gaetan and Fanny for sharing this experience with Pick The World’s community! True it wasn’t mentionned, Gaetan and Fanny worked in Motueka in 2014 for the kiwifruit season, which runned from mid-April until mid-May in this particular orchard. 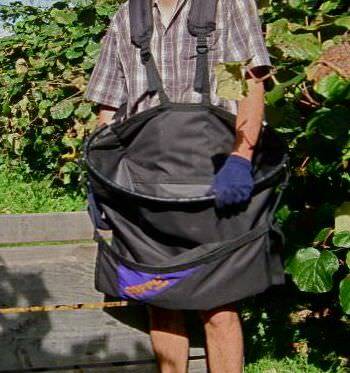 Hey would it be possible to get the contact of Gaetan, in order to get the address of the farm? We are on our search for a place now and we kind of struggle. In the meantime, you should look for an apple picking job. Season will start soon in the Motueka/Riwaka area.